We arrived in Charleston just in time for Matt to take off for the church to meet Eric for a young adult worship night. Eric is the worship pastor at East Cooper Baptist Church…so he and Matt had a lot to talk about! 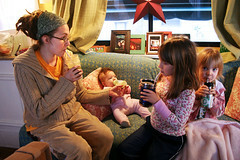 Kristi and I stayed at home with the kiddos and enjoyed getting to know each other “in real life”. She and I have exchanged many, many emails and it was so fun seeing her face to face. She is a stay at home mama and web designer….among other things. You can see her blog here and her business, Poco Creative, here.Eric and Kristi’s home is delightful and their kids are so fun! The oldest, Lydia, is just a little older than Bella…so as soon as we walked in the door, they were off playing. Steven, their middle child, is possibly the biggest sweetie ever…check out the photos and you’ll agree! I loved how he called Matt “Mr. Matt”. That is something new to us … in the Midwest we don’t call people Mr. and Miss the way they do in the South. We’ve caught on quickly though! Mr. Matt and Miss Sara in the house! Hee hee. Their youngest, Meredith followed the kids around all weekend yelling “Ella!!….Ella!!”. She wanted so badly to be a part of the big kid’s action! There was never a dull moment with so many young kids running around all the time! 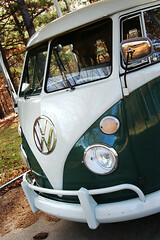 They especially loved to come into the RV and just “be”. The RV is especially attractive to children…I think because it’s a small home and it’s the perfect size for them. It almost feels like a playhouse! Steven would head straight for the driver’s seat every time he walked in…he felt so big and grown up in that spot! Our bed is often turned into a “playroom” and the girls were quick to find the Polly Pockets and dress up clothes and had a party going on back there much of the time. Eric and Kristi have a great yard too…and the kids spent time running and playing in the sun. It’s so nice to finally be in warm weather…sunshine makes everything better! 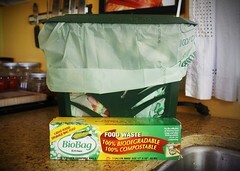 On Saturday, we had a demo at Earth Fare. We were located in a really busy parking lot with lots of surrounding businesses, so we had a great flow of people and interesting conversations. A young lady named Sarah brought her mom and friends to see the RV…Sarah had interviewed us a few days prior for a newspaper she writes. 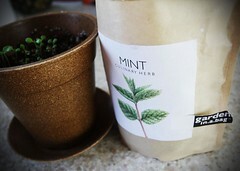 We enjoyed chatting about all kinds of green things, and also how our faith and environmental concerns mesh together. She’s just one of the many cool people we had the chance to interact with that day…I wish I could write about them all! We headed to downtown Charleston, where they took us out for an AMAZING dinner of Thai food at Basil Thai Restaurant. If you’ve been following along on this blog for awhile, then you know of my obsession with Thai food. Oooooh how I love it…Matt loves it too, so I’m lucky! If I’m going to eat cooked foods; I want it to be Thai!! The green curry with tofu is my favorite…although the traditional pad thai is a close second. Oooh…I get hungry just thinking about it. Eric ordered some mango sticky rice to go…and we all nibbled on that as the kids played outside. We had never had sticky rice before, and it was very tasty! After supper, we explored the downtown a bit and then headed down to Folly Beach. 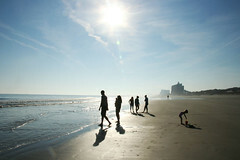 We had been told by several people that Folly Beach was the BEST beach on the east coast. We got there just at sunset and it was, of course, GORGEOUS. And COLD! We’ve been freezing cold during all of our ocean experiences…someday we’ll actually get to be in some warm water. Despite being cold, the HUGENESS of the ocean is always sobering and awe-inspiring and brings to mind how vast the hand of God is and how far He reaches. Throughout our tour, we have been reminded over and over of His artistic creations in nature. Amazing. 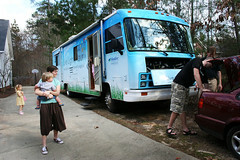 On Sunday, we brought the RV to Eric and Kristi’s church and had a demo there after each of the services. East Cooper is a fabulous church, and if you like to listen to online sermons, be sure to check out their pastor, Buster. He’s passionate about what he does…and is a dynamic speaker. The weekend we were there the sermon was called “A Life of Abundance”. Check out their sermons here. On Monday night, we did demo for their small group that meets at their home…we had a great time sharing with them about the tour and our thoughts on green living, possessions, Christianity and how they all mix. 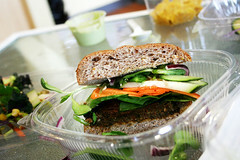 We also had some great discussion about healthy eating and raw foods. On Tuesday, on our way out of town…we all went to The Sprout, a raw restaurant in Charleston. It was totally random that we even found out about it…I saw it announced as “Best Burger Made of Seeds” in The Best of Charleston issue of an alternative newspaper. The Sprout is owned by Chef Mickey and his lovely wife Caroline. They moved to Charleston from California…Mickey worked at Café Gratitude while there, and Caroline was a yoga instructor and had her own business as well. You can read more about them here. I’ve read a lot about Cafe Gratitude…we will definitely be stopping there when we get to San Francisco! I’m excited to get their cookbook as well. 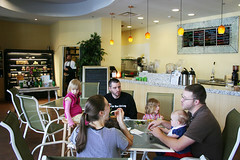 When we walked into The Sprout, I knew it was going to be a great experience! It was bright and spacious and I could just smell the deliciousness! Mickey greeted us and after we told him what we were doing (the tour, raw foods, etc)…he brought us back for a little tour of their operations. Have you ever seen a dehydrator this big? Wow. We met all of their friendly staff…including Aaron (who has a sweet tattoo)…he and his wife, and their 2 kids just got back from WWOOF’ing in Hawaii. Talk about a dream! We’ve looked into WWOOF’ing and it was fun to talk to him a bit about it. His wife has an Etsy store called Myopic Visions selling her felted wool goodies…she has a buy one, get one free sale, so be sure to go check out her stuff! 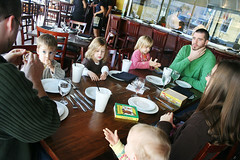 Our meals were predictably amazing and we enjoyed them thoroughly! Their nut burgers are out of this world. Yum. I had the pad thai…and it inspired me to get my own spiralizer for squash/zucchini so we can have pad thai noodles too! Wow. After we ate, the whole crew came out to the RV for an impromptu demo … along with the team from Dwell Smart, a green living store just next door. They have a huge variety of all kinds of green goodies. I could get lost in there for hours! Mickey surprised us as we were leaving with a HUGE box of organic produce (apples, oranges, kale, celery, ginger, cucumbers, and more) and every kind of raw cookie, burger, desserts, crackers etc. that you can imagine. We are still eating the giant bin of flax crackers that he gave us…what an amazing blessing! To top it off, he gave us 2 travel mugs that are made from corn! We were so blown away by their generosity and kindness. Thank you to The Sprout team for fueling our bodies with delicious raw goodness and for spreading the raw love around the Charleston area. If you are nearby…go in and see them today! Charleston was a blessing of abundance for us…abundant fellowship, abundant fun, and abundant FOOD! Thank you Eric, Kristi, and kiddos (and everyone else we met!) for being our “temporary neighbors”…and friends for life! A rather large photo album here. We arrived in Lexington, SC on a beautiful afternoon…greeted by little faces anxious to see a big blue bus arrive in their driveway! Aimee and her crew were ready and waiting and helped us get settled…we felt so welcome (especially when we walked in and saw this!). Aimee is the amazing mama who writes the blog Living, Loving, and Learning Simply (which I know many of you read faithfully!). She is every bit as amazing in person…and her house just as organized! 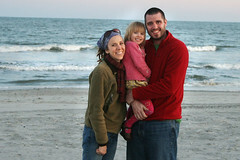 Mike and Aimee were previously on staff with Campus Crusade for 10 years before moving to Lexington. Soon after we got there, people started arriving for the potluck (including Mike…husband to Aimee and loving daddy to the clan!). We had a delicious spread of goodies and great fellowship. We met so many wonderful, passionate people and had a such fun talking late into the night about everything from raw food to travel to ministry. We had the chance to meet Rebecca and her family…Rebecca was a huge help during our planning process and helped to set up our demo location at 14 Carrot. We also met Bjorn and Michelle and their daughter, India. This lovely couple met in India doing ministry and are now in nursing school. I had the opportunity to capture them before we left town. Aimee and Mike took us out for a DELICIOUS meal at Miyos. The veggies there were the freshest I’ve ever seen! It was great. 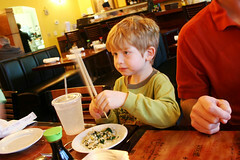 The kids all had a fun time learning how to use chopsticks. 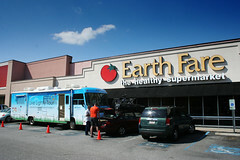 After that, Aimee and I headed downtown to Earthfare, where the Holistic Moms Network Open House was being held. I talked with some really fun moms there, and even got a free chair massage. Aahhhhhh! Bliss. I enjoyed a fresh carrot, juice at their juice bar and went grocery shopping before we headed out into the raging thunderstorm. We barely made it back to the house before the electricity went out and stayed out for quite awhile! Luckily, our solar bank powered our 12 volt power and we continued to have electricity (and our generator would have powered us beyond that)…one of the joys of RV living! Of course, we might have blown away in the storm, but at least we would have lights on inside to enjoy the ride! 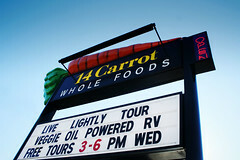 Our demo in Lexington was at 14 Carrot, a locally owned health food store. Ed and his team welcomed us and we got set up. I was pleasantly surprised to find that they had an extensive raw foods/ingredients section. I was able to pick up 3 different varieties of dates from The Date People, raw carob powder, and other raw goodies. I was in raw heaven! During the demo, we had the chance to meet some truly wonderful people! Gwen and her kiddos came by to say hello. Gwen has read my blog for quite awhile and it was so great to meet her face to face! She made Bella and I the cutest grocery bags from t-shirts…Bella asks to use hers everyday. We also had the chance to talk for several hours to Melissa and her 3 boys, as well as Katie and her 2 girls. 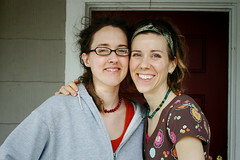 Both of them are into raw food…in fact Melissa and her family have been raw for over a year! 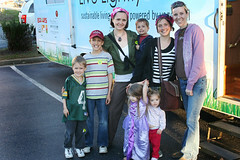 It was so cool to see a family who is passionate about raw foods and is so full of life and energy. Her boys were so excited when I pulled the dates out of the fridge! What fun. Katie and her husband just got back from a year at IHOP in Kansas City and we had a nice time talking about their experience there. That’s the International House of Prayer, not the restaurant! I’ve been in contact with these mamas back and forth a few times since leaving Lexington. It’s so fun when we connect that way randomly at a demo…God brings us such beautiful people on this journey. While we were there, Matt spent pretty much every day, all day working on Mike and Aimee’s master bathroom, which he tore down a wall and installed white bead board throughout. It’s now a gorgeous getaway for Aimee and she loves it. Matt LOVES doing projects…so if you have some (and you’re on our tour route), contact us. 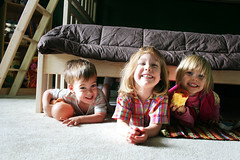 Bella had so much fun playing with Aimee and Mike’s kids…they are a delightful and inquisitive bunch. We especially had fun doing a little mini yoga/stretching class in the backyard in the sunshine and playing on their swing set. Bella also loved all of their princess “gear” and good DVD’s! Our time in Lexington, SC was so relaxing and filled to the brim with new friends. And now we’re off to another South Carolina gem…Charleston! Photo album of all the good times here. After we flew back into Raleigh from Minneapolis, we headed back down to Florence, SC where the RV was parked (see our previous visit here). Becky and Rocky had generously offered to let us park it there for the 2 ½ months that we were gone. Becky is absolutely one of my most favorite people in the entire world. For those of you who are new here…Becky is the one who did my dreads back while we were in Boulder, CO. She is one of those people who when you are not with them, you really, really miss them deep down in your heart of hearts. She has such a gentle, sweet spirit and is so completely unique. She is a talented artist, a grace-filled mother, and generous friend. She makes me laugh so hard…especially when she is impersonating the Canadian Border Patrol. Oh my word. Every time I watch that now…I can’t watch it without dying laughing, thinking of Becky impersonating him all around the house (“I can’t go back! 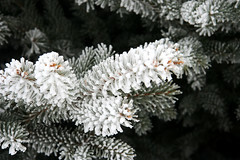 It’s so cold!”). We had decided to spend an additional 2 weeks with them in Florence…because we love them, and boy did that time just fly by! I suppose it was probably the closet thing we’ve had to true communal living … and of course that is a dream of mine, so it was delightful. It was so fun to have someone to share every moment with…and yet have our own living space. Bella and Lilli became best of buddies…and even now I catch Bella saying things with a little southern accent, just like Lilli It was great for her to have a friend that we didn’t have to say goodbye to in just a few short days! In the mornings, we enjoyed our leisurely family routine of making green smoothies together. On several mornings, I would step out our door and into their back door to give the lovely Becky some green goodness of her own. Over the weeks that we were there, Becky and I shared many delicious raw meals together, mock tuna, mushroom sushi rolls with citrus miso dipping sauce, chocolate smoothies, quinoa tabouli…and the infamous “magic carrot juice”. Oh my goodness. Since we’ve departed Florence, Becky has continued on a raw diet and has gone gourmet on me! She taunts (encourages ) me by calling and telling me all of the amazing raw treats she’s making in her dehydrator…but she did say she would mail me a raw care package with some of them! Yay! Rocky and Matt had some fun times together as well…they both play guitar (Rocky runs a music store), so they had plenty of time to play. They also installed a dishwasher…and only made a few sparks fly (ack!!). They enjoyed some “boy movie nights” together and in general, had fun picking on all of the girls. •	The Rope Swing…this was definitely Bella’s highlight of the entire 2 weeks. She LOVED that thing. Even the adults would get in on the action…Rocky would break out the ladder and we would stand up on top and jump off into a blissful “weeeeeeeee” across the front yard. •	Yoga class with Becky…I had wanted to learn more yoga so that I could use it while we are on the road to relax and stretch. Becky has been practicing yoga for quite awhile and taught me the basics and blessed me with a yoga mat for me and for Bella. We have having so much fun with it! •	The Midnight Rooster…we went here on our previous visit and just had to go back and see the lovely Jessie and her amazingly cool coffeehouse. She serves up a mean salad…yum yum! We had the pleasure of meeting several more of Becky’s friends while we were there. So fun. •	Out For Coffee with The Girls…the night before we left, we headed out with the girls. Becky’s friends Tami and Ranney helped to keep the conversation lively. We talked about raw food, travel, dreams, our futures…it was a night I thoroughly enjoyed. Becky and I also spent another night listening to music and sipping tea at a local coffee shop the week before…laughing so hard and finding the jackpot of all banana hunts. •	The Hammock Chair on the front porch is something that I DREAMED about when I was freezing in the -50 windchills of Minnesota. I love hammocks and I love front porches. I loved to sit here and just think. One day, Becky came out and read short stories to me as I closed my eyes and rested in the sunshine. What a good friend. •	Worship Night…we were able to enjoy a night of worship at Rocky and Becky’s church. It was the first night they had it…a mixture of art, music, poetry, and scripture. Becky did colorful large drawings on stage DURING the singing portion of the worship and it was so powerful and moving. I cried! Matt and I both had such a powerful time with the Lord there…it was such a blessing for us. It was so bittersweet to leave Florence. On the one hand, we were definitely excited to get on the road again and continue the tour…on the other hand, we had SO MUCH fun with Becky, Rocky, Lilli, and Juniper. We will always remember those days with fondness…such sweet fellowship. Eight days of relaxation and fellowship…ahhhhhh. Just what we needed to recharge before the holidays! 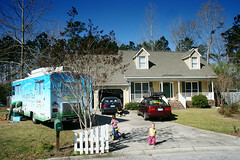 We pulled into Florence on Monday afternoon and drove to the home where we would be parking our RV for several months. We were greeted with lots of love…and reunited with one of my sweetest friends, Becky…and her husband Rocky. Becky and I met on MySpace over 2 years ago…and a friendship formed. We started talking more and more…exchanging things in the mail, talking on the phone…etc. 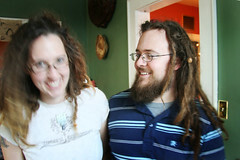 So when I decided to dread my hair, I immediately thought of Miss Becky (she has amazing dreads herself!) and asked if she would be interested in coming to Boulder when we were there visiting family and friends over Christmas. She had a friend in Boulder at that time too…and I was so excited when she said YES! Weeeeee! I was on my way to meeting one of my most favorite people! We had a wonderful time in Boulder getting to know each other IN PERSON. It was a blessed time of fellowship. We spent an amazing afternoon in Hartsville at The Midnight Rooster. Becky’s dear friend Jessie is the owner of this adorable establishment and we had a great time eating veggie delights and sipping lattes while the girls danced on the stage and entertained us all. 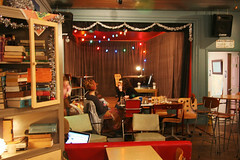 This is the kind of coffee shop that you just want to stay and stay and stay some more. It’s eclectic, warm, funky, and fresh (I just like saying funky and fresh in the same sentence). Check out some of the other pics I took there and you’ll see what I mean. Lots of great ideas for decorating there :). I want to go back! We went to Marianne and Kirk’s house. I wish I could truly explain with words what it means to be at their house…it’s an experience that you need to have in person. They have 6 kids. They have a huge open hearth fire. 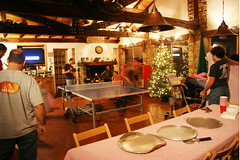 They have a ping pong table in their family room. They have a wood fired oven in their totally crazy amazing commercial kitchen. And the moment you walk in, you feel like you’ve been there 100 times. They were missionaries in Italy for 9 years. Marianne is like a mother to everyone near her…she’s Italian. She’s beautiful. She can cook like no one’s business. That night we had wood fired pizzas…on the most tasty crusts I’ve ever had. The olive oil they used for the meal that night had been pressed just 3 weeks prior in Italy (they order it direct!). They have the kind of house that you want to stay and stay and stay. We met Tami. 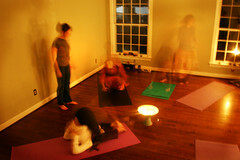 Beautiful, world-traveler, aspiring midwife, yogini Tami She holds a yoga night at her adorable home and we went over to say hello. Of course, once I was there, I had to capture it in photos. I loved looking around her home…you can tell so much about a person by what they choose to surround themselves with. It was so fun to see all of her treasured items…a necklace from Africa was my favorite. I also loved how she didn’t have a couch…but a soft futon on the floor, covered with pillows. I may have to steal that idea someday So inviting. A few days before we left, we packed all the kiddos in the van and headed to Myrtle Beach. It was a beautiful 75 degree day, and we had so much soaking it all in. Lilli and Bella were CRAZY in the water (even though it was COLD!). They played in the sand all day. We saw a horseshoe crab and found lots of seashells. Rocky and Matt stayed at the water’s edge with the girls while Becky and I walked and chatted. There is just something so soothing about the sound of the waves. I could have stayed and stayed and stayed! Noticing a pattern here? Becky and Rocky play in a band called Rosewater Faire…and I fell in love with their music the first time Becky sent me a CD 2 years ago. 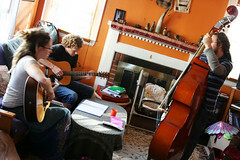 We had the other band members over on Sunday afternoon for lunch and we were treated to an impromptu concert in the living room. Yay! Becky sings lead…she has the most beautiful, smooth, haunting voice. Be sure to check out their music on their MySpace page. They haven’t been playing actively for awhile…but they still sound great! We had a couple different families who have been following our tour stop by the RV to see it and say hello. Debbie brought her son and his friend and Hope brought her daughter Claudia to play with Bella. The best part about spending time with this family is that it’s just “easy”. Everything feels so comfortable. Bella and Lilli had so much fun playing together every day in their cute little fenced in yard. Their house is so warm and wonderful…with music always playing, tea always brewing, original artwork adorning the colorful walls. Becky spoiled Matt with one too many pans of rice crispy bars…and he loved it They fixed us “grits”…which I promptly put butter and brown sugar on. Oh boy…you would think I was going to be kicked out of the South for that one Apparently they like to put cheese and salt on them. Ish! Rocky and Matt had “boy time”…and we had “mama time”. It was definitely hard to leave Florence…but we knew that we would be back! We are planning on spending more time there when we get back from the Midwest. It will be a welcome change to go from ZERO degree weather…back to warmth! Myrtle Beach photo album here.